Facebook today introduced a feature that allows users to snooze certain keywords. When you don’t want to see posts about a current event, or a show, or even just something you don’t want to look at for a while, you can simply snooze posts which contain words related to that topic. 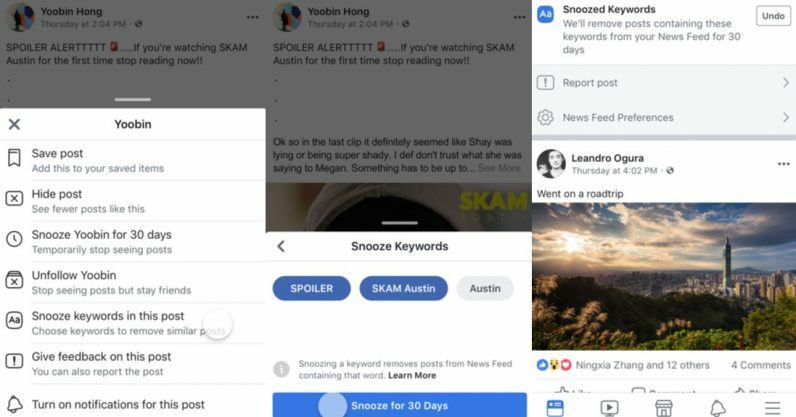 First spotted by Chris Messina and pointed out by TechCrunch, it’s a variant of Facebook’s option to snooze people and pages you didn’t want to see, which was introduced last year. The period of quiet time is the same, too: 30 days. The option is fairly simple to use: if you see a post with the offending keyword — say “Infinity War” or “Game of Thrones” — you can select the option to snooze keywords from the post in the drop-down menu on the top right. When you select the option, you’re given a list of keywords pulled from the text of the post, and can select which ones you want to snooze. One downside is that you currently can’t un-snooze a keyword once you’ve set it. So if you’re seeing the latest episode of Westworld a few days after it premieres and you’ve decided to hide any posts about it until then, you won’t be able to turn off the snooze option once you’ve done so. You’re just going to have to wait out the 30 days until you can see posts about it again — by which time new ones aren’t likely to be made anyway. That said, a spokesperson said the company is working on options for different snooze times, as well as an off button. At the moment, the snooze option is being tested among a small group of users. Facebook hasn’t said when it’ll roll it out to the rest of us, but a spokesperson did say the off button would be hopefully added to the feature within the next few weeks. Read next: Who should get to decide what's ethical as technology advances?